(i) Arduino-compatible, to allow use of XOD visual programming and simple implementation of code. (ii) Availability of expansion ports and ability to connect sensors and actuators. (iii) Options for connecting display devices to build user interfaces. A number of Arduino-based microcontroller kits have been made available - that are suitable for advanced training and project development. This an area of continued development as hardware and software resources continue to improve. Here, we provide a description of our efforts (the Biomaker Starter Kits I and II) compared to a list of other useful kits. The Mk II Starter Kit contains an extended Arduino board, components, small prototyping board and programmable display. It is based on the Open-Smart Rich UNO R3 board, which contains a variety of embedded components, including sensors, 7-segment 4 digit display, real-time clock, touch sensors, buzzer, mp3 player with microSD card holder and expansion shield. Importantly, the connections to the embedded components can be turned off using a DIP switch. The board is Arduino UNO compatible, and can be programmed directly from XOD. Click here to download the board manual (4.9 MB PDF). Further, we provide a kit of components that includes a wide range of sensors and displays. The kit includes: the Arduino board and: IO Shield, Voltage sensor, Ultrasonic sensor, Touch sensor, Water sensor, PIR motion sensor, Rocker switch, NTC sensor, Light sensor, Slide Potentiometer, Vibration motor, Passive buzzer, Speaker, 8 LED bar, Eagle eyes LED, I2C 1602 LCD, 4-Digit display, microSD card (256MB), CR1220 button battery (40mAh), Infrared Remote Control (with one CR2032 battery), Micro SD card adapter, Infrared emitter, 40pin female to female cable, USB cable (50cm). Prototyping shield with mini bread board. We also supply a 4D Systems 3.2" gen4 programmable touchscreen (see below), which can be controlled from within XOD. Wide variety of additional devices provided on the circuit board and as additional devices, programmable touchscreen allows creation of sophisticated user interfaces. On board devices can be toggled via a DIP switch to allow reuse of I/O ports. 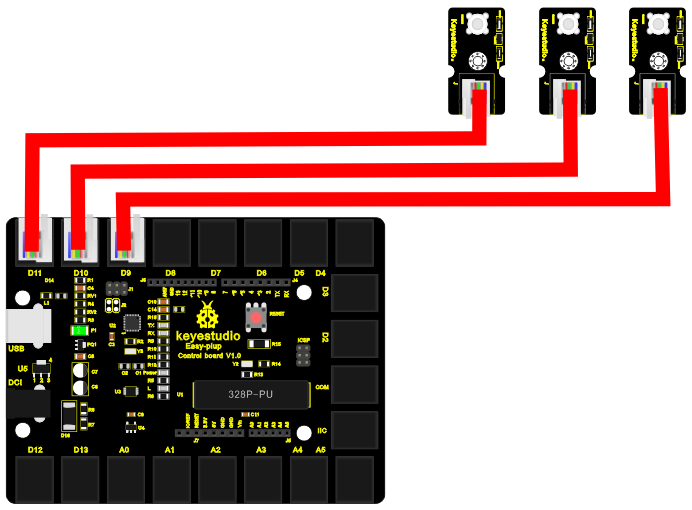 The Gtronics Proto Shield Plus provides a base to plug in Arduino boards, and to integrate custom shields and components on a large plug board. On-board push buttons and an LCD display are provided. A comprehensive manual for the board can be found on the Gtronics website (http://www.gtronics.net). The ARDX Starter Kit for Arduino is a component-based learning resource with components to build 13 different projects. The kit provides a manual with a series of lessons. These provide a simple way of learning how to wire electronic circuits, complete with a set of paper circuit templates to lay over the breadboard and push the components through - to remove the worry of wiring the project incorrectly. Grove is a modular plug-in format for electronics prototyping. Simply plug the Grove modules into the provided Grove shield. 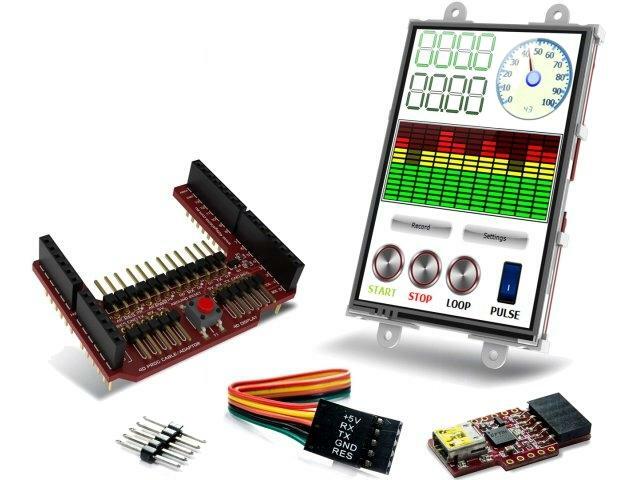 The Grove Starter Kit contains 10 of the most popular Grove modules and Arduino shield. In addition, the Sidekick pack contains basic components, an additional small circuit breadboard and hook-up wire. The MkI Starter Kit included a 4D Systems 3.2" gen4 touch-responsive programmable display (with memory card, Arduino interface and programmer). Flexible, but relatively expensive. Mixture of plug-in Grove parts and discrete components. Arduino UNO board with switches, potentiometer, temperature sensor, light sensor buzzer, bluetooth module, five addressable LEDs, RGB LED, LCD display, programmable RGB LEDs, OLED display, microphone, 7-segment display, IR receiver. Space to plug in an expansion shield. Jumpers to reconnect I/O ports. TME Education was founded by Transfer Multisort Elektronik, one of the leading global distributors of electronic components based in Poland. They have developed the hardware to promote training in electronics, and run a number of international initiatives. Thoughtful collection of on-board hardware components, including a variety of LEDs and LCD and OLED display devices, which can be unplugged by removal of jumpers. An all-in-one Arduino MEGA 2560 prototyping lab for learning, prototyping and quick debugging. Multiple wireless communication options like HC05 & ESP8266, re-programmable menu based visual interface with built-in functions, compact, lightweight, portable and equipped with a rechargeable Li-ion battery. Added safety against reverse polarity, over-current and short-circuit, precise voltage in range of -30V to +30V and current sensing -3A to 3A, 1.8” TFT display with data visualization and logging features, a built-in mini-oscilloscope and function generator. Designed as a tool for DIY project making for university & school students, hobbyists, prototype developers and professionals. Clever integrated design with function generator and oscilloscope, compact, but space for expansion shield and proto board. Keyestudio supplies a wide range of EASY plug compatible parts, including an I2C expansion board. Keyestudio also supply boxed kits of selected parts. A list of EASY plug parts can be found at: https://wiki.keyestudio.com/Category:EASY_Plug. Very easy to add and rewire I/O devices to the microcontroller board in an educational context - prevents mis-wiring. Arduino-based mini laboratory with a variety of measuring instruments, voltage supplies, organized on 3-dimensional frame (built with Totem beams). 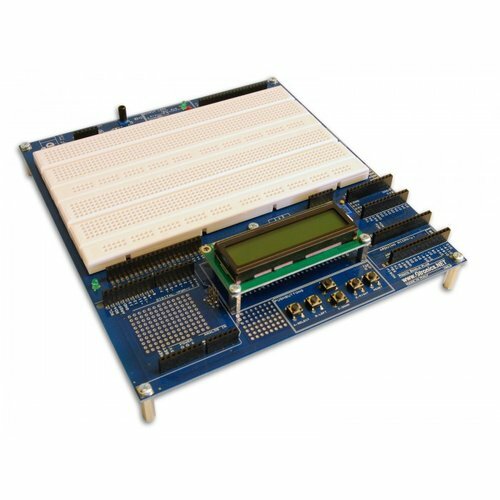 Is provided with breadboards, and optional side panels, with wide range of peripherals. Well suited for circuit analysis and electronic testing. Example of potential utility of Totem beams (available separately). Trainer board from MyDuino.com, based in Malaysia. Arduino Nano compatible, NodeMCU (Arduino-WiFi compatible board), radio HC-12 433MHz port, Bluetooth HC-05 port, 10K potentiometer, 16x2 LCD display, DHT11 (humidity and temperature sensor), light sensor, real-time clock, push button, light emitting diode (LEDs), LM35 (analog temperature sensor), small breadboard and Arduino shield footprint, RGB LED (red, green, blue), passive buzzer. Well equipped for wireless communication, in-built display, real-time clock and shield expansion. Arduino UNO compatible board with a useful collection of on-board components - including LED bar graph, slide switch, temperature sensor, light sensor, RGB LED, slide potentiometer, microphone, push button and 3-pin add-on header. The board comes with a detailed manual, Ardublock software, and set of tutorials, however these resources are not compatible with XOD. Useful selection of on-board conmponents. Expansion is limited. Apollo V2 Arduino trainer board from Ascension Engineering. 16x2 character backlit display, piezoelectric speaker, three potentiometers, five buttons, micro SD slot, temperature sensor, barometric pressure sensor, light sensor, LEDs, digital to analog 4 channel converter, direct connect pins for servos and I2C connector for quickly connecting external components. Step-by-step instructions and design files for building an Arduino MEGA based training board, described as a project at hackster.io. The project includes details for creating and outsourcing production of a custom circuit board. 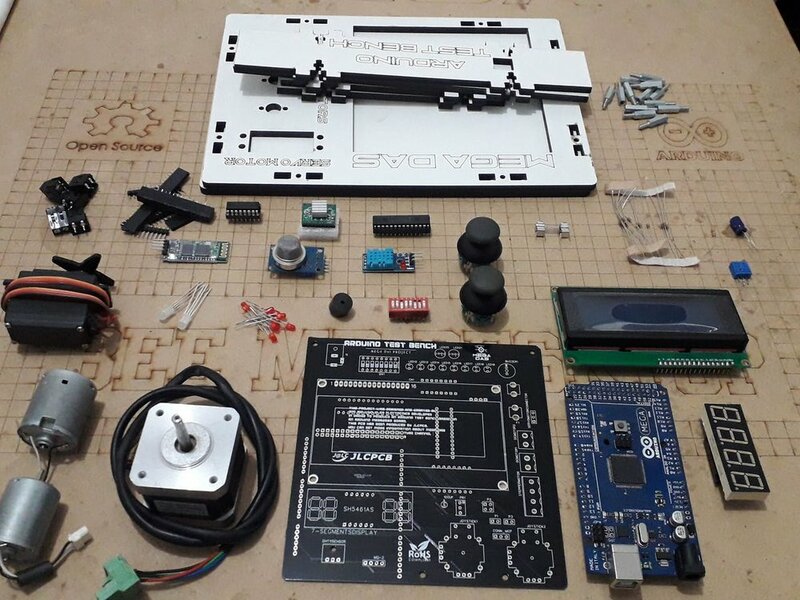 The design includes an Arduino Mega2560, LCD display, 7 segment display, eight red LEDs, two RGB LEDs, one buzzer, eight switch bar, joysticks, DHT-11 sensor, gas sensor, Bluetooth module, MCP23017 integrated circuit, A4988 stepper driver, L293D motor driver, NEMA17 stepper motor and DC and servomotors. Guide to design and assembly of a customised training platform including guide to outsourced manufacture of the circuit board.